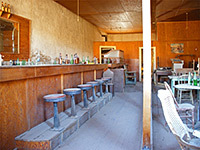 Of all the hundreds of ghost towns across the Southwest, none is as authentic and well preserved as the former gold mining settlement of Bodie, built high in the hills on the east side of the Sierra Nevada in a particularly remote part of California, near the state border. Although only about 5% of the original town remains, the rest having succumbed to fires or the harsh climate, Bodie retains over 150 wooden buildings, intact and largely unrestored, many still holding all their original contents. 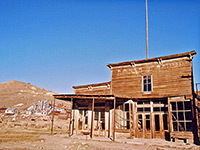 Most ghost towns are either easily reached but semi restored and commercialized (such as Calico, near Barstow), or are hard to access and have little remaining (for example Copper Creek, Arizona), but Bodie is unique. The difficult approach - partly on an unpaved road - and far-away location are two of the main reasons why so much of the original structures remain, plus the early date of state park protection (1962), and the decision not to restore anything, just keep the buildings in a natural state, carrying out only limited maintenance as required to protect against the elements. At 8,375 feet elevation, and with an isolated setting on a treeless, windswept plateau, the town suffers from long, cold winters producing up to 10 feet of annual snowfall. Visitation is comfortable from about May to October; although the park is open all year the access road may be impassable some of the time due to snow or mud, and the temperatures fall very low in winter. Bodie is one of several attractions along a scenic 60 mile stretch of US 395 north of Owens Valley, which include Mono Lake, Devils Postpile, Mammoth Lakes and Hot Creek. The paved, well-signposted road to the ghost town branches off the highway 6.5 miles south of Bridgeport and heads east, winding along the low, bushy valley of Clearwater Creek, past a few places suitable for free camping, then up into a range of deserted hills. Barren, undeveloped plains stretch in all directions and the road gains a real feeling of remoteness. The pavement ends 3 miles before the state park, replaced by a ridged and bumpy gravel track which rounds the upper end of a valley, crosses a ridge then descends for a mile to the state park. The buildings are visible from some distance away and become gradually more impressive closer up as the scale of the town becomes clear. The track becomes Main Street in town though the built up section is closed to public vehicles, and instead the road bends round to the left passing the entrance station, which is staffed by several rangers who live here year round. At least one ranger, maybe on purpose, has wonderfully long, unkempt hair and beard, and it is easy to imagine him being one of the original miners. Fees (2019) are $8 per person ($5 for children), and the site is so extensive that at least half a day is needed to see everything. There is no charge for people just driving through, as past Bodie, two tracks continue to other, more remote though less complete mining settlements including Upper and Lower Town in California and the Aurora Historic District in Nevada. These roads are rough and may require 4WD. For an additional $1, the park sells an illustrated brochure that contains a detailed map and walking tour guide. 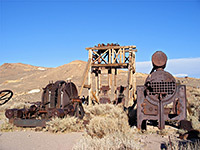 There is no official campsite anywhere near Bodie, nor any other visitor services. The closest main town with hotels is Mammoth Lakes, 58 miles away along US 395. The visitor carpark is at the west side of town, near to one of the two principal roads - Green Street, which crosses Main Street and continues towards the mining district, on a hill to the east, though all of this is closed to the general public due to hazardous conditions, apart from some of the mine buildings that can be visited as part of a ranger-led guided tour (once daily in season - cost $4). Several other named streets remain from the original town, and about half of the 100 main buildings are substantially or entirely complete. The largest are such staples of any western mining town as the sawmill, jail, cemetery, union building, post office, and several hotels, stores, bars and stables. All are made of wood, aged by time and weather to a rich golden brown, not quite like normal old timber, and especially rich in late afternoon sun when they glow yellowish-red, matching the color of the mineralized earth in the surrounding hills. But the site is photogenic all the time. The ground is littered with old debris, ranging from rusty iron cans and broken bottles to huge winch equipment and mining machinery. Most houses are locked though a few are open for interior viewing, and many still contain all the original contents, seemingly left in haste - clothes in the wardrobe, food tins in the kitchen, paintings on the walls, beer bottles in the dining room. Particularly evocative buildings include the schoolroom, Dechambeau Hotel bar and general store, all completely untouched as if time has shifted back 60 years, were it not for the thick later of dust that covers all the contents. Aside from the few dwellings used as employee residences, only the post office has been adapted, for use as the visitor center/souvenir shop, though even this retains its original decor and some of its contents. The town was established in 1861, 2 years after Waterman S Bodie unearthed traces of gold in the nearby hills, though the find was not of lasting benefit to him as he died in a snowstorm just two months later. 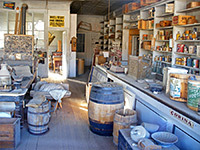 For the next few years only around 20 people lived in Bodie but following discovery of a much richer seam of gold ore by the Standard Company in 1877 the population expanded to nearly 10,000 in just 3 years, several hundred of whom were Chinese laborers and lived in a separate section of town complete with its own shops, bars and houses. As with all western boom towns, the ore was soon exhausted, and Bodie suffered two devastating fires in 1892 and 1932 that together destroyed over 90% of the buildings. A few residents stayed until the 1940s after which the site lay abandoned for 20 years until the creation of the state park in 1962. Map (764 kB), Park Information (352 kB).